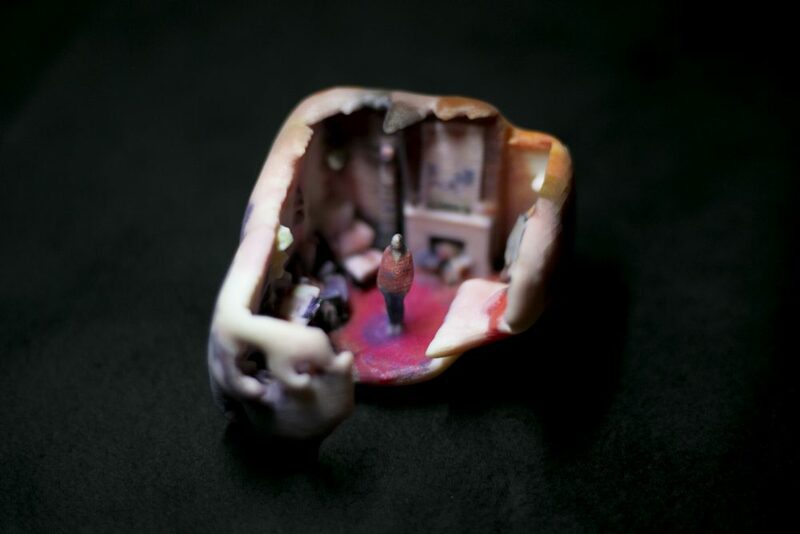 The first piece I’d like to share is WATERTIGHT, a collection of 3D-printed portraits of New York single-occupant homes and the inhabitants that occupy them. The proportion of people who live with other people – with family, friends, tenants, roommates or strangers – is in decline in cities around the world. In Manhattan – New York’s most dense borough – more than 50% of inhabitants now live by themselves. Like hermit crabs, each resident adopts the shelter that they can access and personalizes it based on their histories and contexts. Some units are better suited to living than others. The phenomenon of New Yorkers living alone is encapsulated in a series of digitally-fabricated sculptures of city-dwellers in their individual living units. The domestic environment of each character forms a protective shell. Inside, the inhabitant fills their space with material embodiments of their personal histories. Each 3D-printed portrait, small enough to fit in the palm of a hand, is a corporeal version of a New Yorker’s story; a glimpse into a life in progress. Each WATERTIGHT character lives alone for different reasons, but collectively they represent a cross-section of the city’s adapting housing infrastructure in this moment in time. For example, Rob lives in one of New York’s last three boarding houses and Jerry is fighting to keep his rent-stabilized SRO, while Alee takes pride in decorating her micro-apartment and Lamora recovers from homelessness in state-subsidized supportive housing. In total, there are twelve specimens in this collection. To fulfill this anthropological expedition archiving human ecology in transition, WATERTIGHT makes use of cutting-edge technology that will soon be obsolete. Using a volumetric scanner, the spatial and color information is recorded. The digital model is then processed and printed in 3D as a physical model. Both the hardware capture device and the processing software contribute unexpected glitches and organic visual artefacts. As such, the technology becomes a documentarian, interpreting this reality with an ambiguous algorithm. It generates an objective yet non-replicable version of these living compartments in a city. WATERTIGHT uses the tropes of academic classification and archiving to present these 3D-printed portraits in the context of urban housing trends, social flux, and digital documentation techniques. The exhibit display draws on the aesthetics of archaeological excavations and natural history museums.